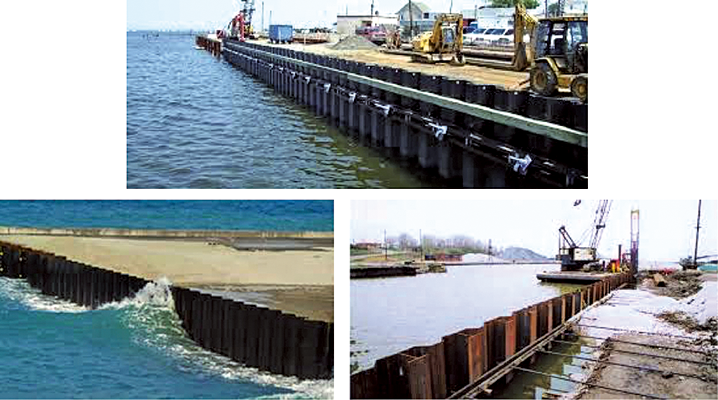 Steel Sheet-Piling (SSP) walls are frequently adopted as retaining structures in quays and wharves, as they may be more economical with respect to concrete caissons or other types of retaining structures. In current design practice, SSP retaining walls are usually designed using simple calculation tools, based on Sub Grade Reaction Models (SGRM) or Limit Equilibrium Methods (LEM). If seismic actions are introduced in accordance with EN1998-5, that is following a pseudo-static approach, then the same methods can be used, at least in principle, for the seismic design of SSP walls. However, depending on wall flexibility, contact properties at the soil-wall interface, strength properties of the system, and assumptions on both the seismic action (amplification/phase shift of accelerations within the soil) and the stress distribution into the soil, these methods can lead to highly over-conservative or un-conservative predictions. Numerical Finite Difference (FD) and Finite Element (FE) methods often provide more economical solutions than SGRM or LEM methods. However, numerical modelling of geotechnical systems under dynamic conditions is quite complex, requiring careful consideration of many factors, including e.g., the definition of the input motion and of suitable boundary conditions and, most of all, the choice of an adequate constitutive model for the soil, and not always readily accessible for the practicing engineer. More rational design procedures, based on the application of the Newmark’s sliding block method, have been recently proposed within the performance-based design framework for the seismic design of both gravity and cantilevered retaining structures. In this context, the critical (yield) acceleration is the key parameter controlling both the maximum internal forces in the wall and the permanent displacements induced by the design earthquake. A possible extension of these procedures to the seismic design of anchored SSP walls requires a better understanding of the dynamic behaviour of these systems to identify the main factors affecting their response under seismic actions. In this respect, centrifuge tests carried out on reduced-scale physical models provide a powerful tool to investigate the seismic response of geotechnical systems in idealised situations, in which the initial state of the soil (usually a homogeneous layer) and the hydraulic and kinematic boundary conditions, and the dynamic input motion are controlled and well defined. The main objective of this project is to provide a better insight into the seismic behaviour of anchored SSP walls, focusing on the main physical mechanisms affecting the distribution of earth pressures on the wall during the earthquake, the possible increase of internal forces in the structural members and the progressive accumulation of permanent displacements. To this end, four centrifuge tests will be carried out at the University of Cambridge, considering different layouts and input earthquakes. The experimental results will allow to understand how the critical acceleration of the soil-wall system governs the behaviour of SSP walls, both in terms of maximum internal forces and permanent displacements, and how the activation of different plastic mechanism can affect the overall observed behaviour. Moreover, based on the experimental outcome, new theoretical methods will be explored for the seismic design of anchored SSP walls.